On the two-year anniversary of the demonstration that kicked off the Egyptian Revolution and the Second Republic, hundreds of thousands of Egyptians came out to demonstrate. They were not so much commemorating the fall of the Mubarak regime as protesting its successor, the government of Muhammad Morsi, the first freely elected Egyptian president in history. 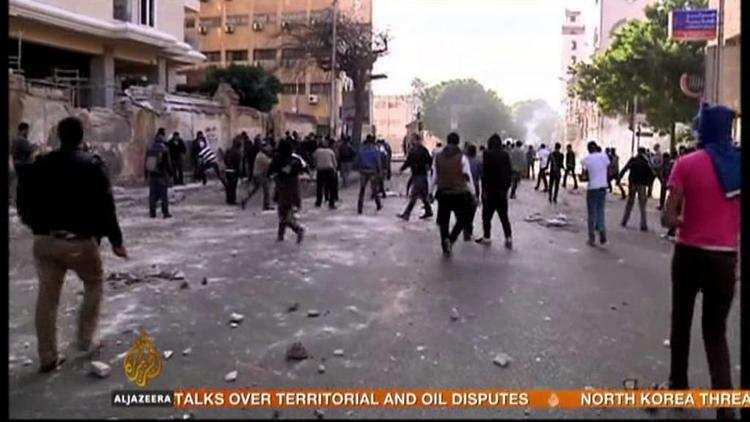 In the city of Suez on the canal, anti-government forces clashed with police, and 7 of the protesters and one policeman are said to have been killed. Another protester was killed in Ismailia. Hundreds were wounded throughout the country. In Egypt’s second city, Alexandria, a huge crowd assembled at Qa’id Ibrahim Mosque after Friday prayers, demanding the abrogation of the constitution and a correction of the course of the revolution. In the provinces, angry crowds attacked government offices, blocked rails, and in some instances attacked the local HQ of the Muslim Brotherhood. In the Delta depot town of Damanhour, protesters set the Muslim Brotherhood HQ on fire. The Muslim Brotherhood itself, which has substantial support in rural Egypt, decided against engaging in counter-demonstrations, for fear that clashes would break out between pro-Morsi and anti-Morsi factions. But the police and security forces, now under the command of the fundamentalist president, were deployed in attempts to disperse the young protesters, just as they had been in the time of Mubarak. Many of the protesters are demanding revisions to the hastily-passed, fundamentalist-leaning constitution, and are demanding that Morsi step down and pave the way for new presidential elections. Morsi expects to be in power for at least 4 years, and by the new constitution could serve two terms. He is preparing for parliamentary elections in late February, in which his Freedom and Justice Party (the civil wing of the Muslim Brotherhood) hopes to emerge dominant. The ascendancy of the Religious Right and its male chauvinist and puritanical emphases has alienated mainstream Egyptians, even many religious ones. Morsi, representing the fundamentalist Muslim Brotherhood, has acted high-handedly has favored market-based solutions to the country’s problems, and has cracked down on striking laborers. It has provoked the anger of secular, centrist, feminist, Coptic Christian, leftist and labor groups. In Cairo, there were several centers of protest, including the iconic Tahrir Square downtown, the presidential palace, the Maspero area around the state television station, and October 6 bridge linking the downtown area with neighborhoods beyond the Nile. There were active clashes between protesters and police on October 6 bridge for much of Friday. The army and state security forces used tear gas against the protesters. A youth anarchist group, the “Black Bloc,” which dressed themselves in black, including masks, attempted to set fire to the presidential palace with Molotov cocktails before being dispersed with heavy tear gas barrages. 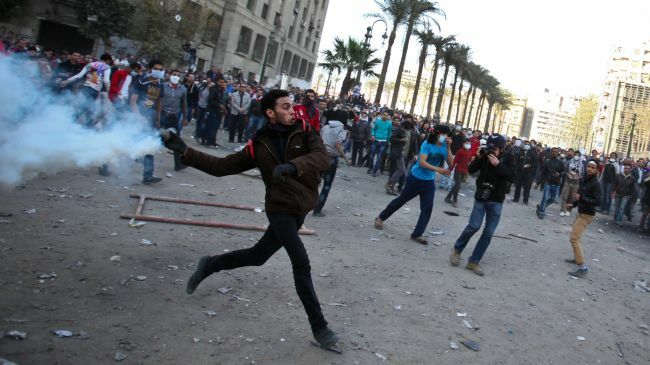 But most of the Cairo protests, despite provocation by security forces, remained peaceful. Protesters are consolidating their position in Tahrir Square and pledging to camp out in it until their goals are met.